Its important for any person or patient reading this page to note that each and every patient is responsible for doing their own research on the said procedure and understanding whether its something that could potentially benefit them and their health conditions. The compiled information on this page is for illustrative purposes only and is not intended to treat, diagnose or inform any patient about a potential diagnosis or treatment. The effectiveness of cavitation surgery varies from patient to patient and is not without risks. Cavitation surgery is not intended to treat, resolve or benefit any specific condition or ailment and patients should understand that they may not experience benefits to their health after undergoing such a surgery. What is a cavitation in the jaw bone? A cavitation is really a colloquial term for “ischemic bone disease” or “sites of alternate healing” which means either an active infection or abnormal tissue growth in the bone of the maxilla or mandible. Ischemic Bone Disease aka “IBD” or cavitations are also called Chronic Ischemic Jawbone Disease – “CIBD”. Chronic ischemic bone disease is a name used to describe a disease process involving pathological changes in the bone tissue related to impaired blood flow (ischemia). In the jawbones these pathological changes are usually triggered by a combination of systemic and oral factors. Additional terms include: osteomyelitis, osteonecrosis, Neuralgia-Inducing Cavitational Osteonecrosis (NICO), Chronic Osteitis, Ratner’s Cyst, Robert’s Cyst, Osteocavitations. These jaw infections can be acute such as osteomyelitis (a highly dangerous, virulent tissue necrotizing bacteria – emergency room is warranted!) or chronic based bacteria (and other pathogens) that arrise due to necrotic or abnormal tissue in the jaw bones. 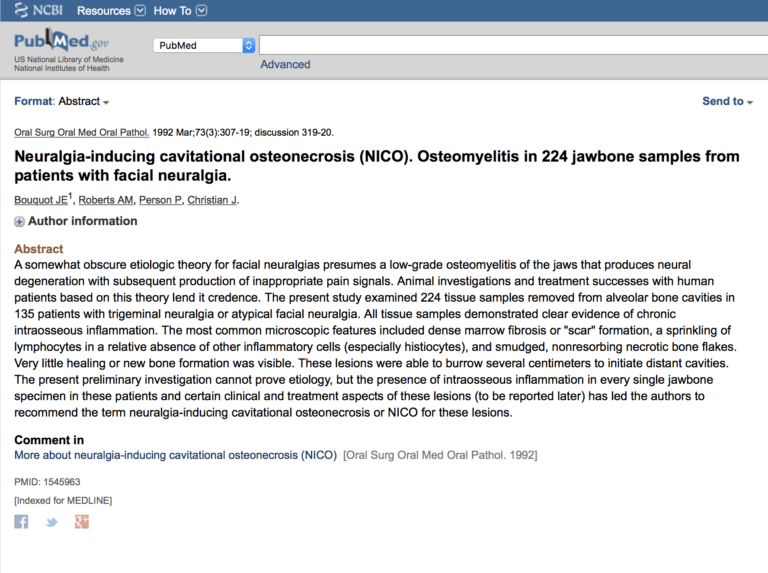 For the purpose of this exploratory article, Ischemic Bone Disease will be interchangeable with IBD / CIBD / cavitation / jaw bone infection. In the jaws CIBD can be complicated by the presence of chronic infections that can be related to periodontal and dental infections, including chronically infected root-canaled teeth. The fact that the jaws contain branches of the 5th cranial nerve ( trigeminal nerve ) is also an situation unique to the jawbones. The frequent use of local anesthetics with vasoconstrictors (drugs that shrinks blood vessels, like epinephrine) can also exacerbate the problem, in addition to the use of other pharmaceutical drugs such as corticosteroids. Toxins such as heavy metals (lead, mercury, nickel, cadmium) and acetaldehyde are contributory factors and trauma in any form can also play a role. 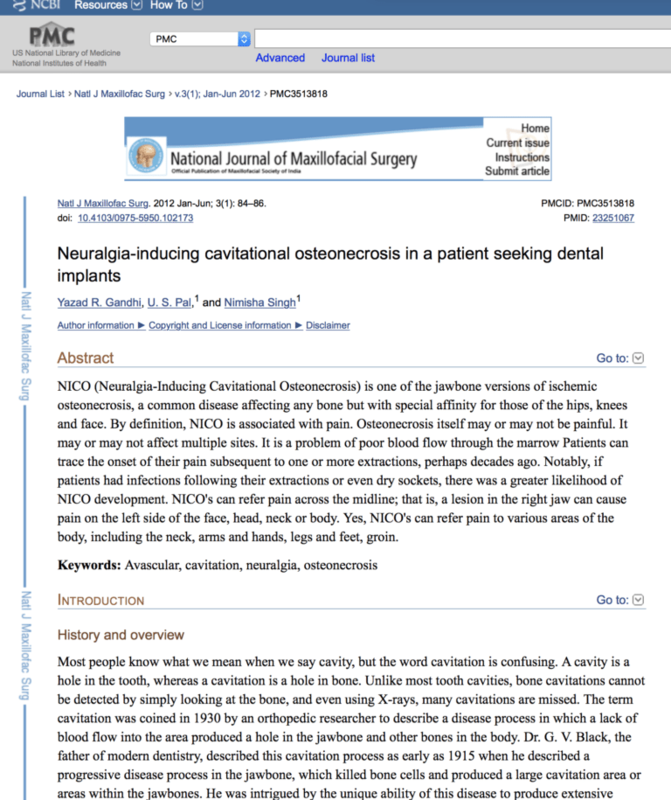 Chronic Osteitis, Ratner’s Cyst, Robert’s Cyst, Osteocavitations and Neuralgia-Inducing Cavitational Osteonecrosis (NICO), the latter being more specific for cases when neuralgia is a dominant feature of the disease process since there are many cases where pain is either absent or a minor symptom. Bacteria and tissue death are the simple and short answers to why cavitations or IBD ischemic bone disease develops. Bacteria that is poorly handled by the body’s immune system colonizes, feasting on existing cellular structure thusby destroying bone and blood supply to the surrounding bone. The term Ischemic Bone Disease medically means “no blood flow to the bone” which thereby creates dead, or “necrotic” tissue. As in many instances of generalized necrosis, which is cellular death, infection is a byproduct which can turn into systemic issues such as gangrene and sepsis. Where does the bacteria come from? There are several known and debated reasons for the development of alternative healing sites or otherwise knowns as cavitation in the jaw. Tooth extractions: Bacteria During tooth extraction surgery (wisdom teeth included) the bacteria is not properly neutralized or adequately flushed out after an oral surgery or extraction. Once the traditional dentist sutures the extraction site, the bacteria multiplies and makes its way into the bone where it begins its onslaught of destroying tissue and bone. Once trapped inside the post-surgery cavity these bacteria can incubate for years, potentially releasing toxic infection residue [bacterial debris and tissue waste (necrotic cells)] into the blood, circulating through the circulatory system and ultimately negatively impacting all the cells of the the body. This of course can cause a host of health issues, both local to the jaw and other areas of the body that we often observe for those patients positively diagnosed with alternative healing sites or IBD. Tooth Extractions: Periodontal Ligament While this remains controversial, it is the belief some oral physicians that upon extraction of a tooth, if the periodontal ligament is not removed along with the tooth, it can cause abnormal healing which results in abnormal tissue and is more likely to develop bacteria. The periodontal ligament supplies the tooth with blood and serum, and upon removing the tooth, the periodontal ligament will die and resorb. However, when the body rejects the left behind periodontal ligament, infection can occur which is thought to potentially turn into IBD, or infections in the jaw bone (aka cavitations.) This scenario can happen under what dentists consider the “normal” extraction situation: the tooth is removed but the ligament that holds the tooth in place is left behind and the area isn’t properly cleaned, and consequently toxins remain within the ligament that slowly seep into the body, potentially creating chronic health issues and other symptoms most doctors can’t diagnose (such as fibromyalgia, heart issues, endocrine issues, neurological issues, among others). Root Canal Infections: Root canaled teeth no longer have an active blood supply, and in the biological and holistic communities are referred to as “ischemic teeth” or “necrotic teeth” because essentially the tooth is a dead appendage due to lack of blood supply. Depending on the strength of the individuals immune system countered by oxidative stress on the cells and overall biological disease processes, individuals can develop secondary infections underneath root canaled teeth. Root canaled teeth with no dynamic pain receptors are especially dangerous because typically the individual does not feel any pain or discomfort until the infection is so large that it can spread to the adjacent teeth, tissues and bone can develop a massive abccess (pus filled infection). The infection in a root canaled tooth can also move vertically into the bone, with the bacteria “eating away” all tissues in its path, regardless of direction. Once the infection from a secondary infection in a root canaled tooth moves into the bone, it can become a case of IBD. While this process doesn’t happen overnight, once the infection has moved into he jaw bone, the patient may still not experience acute discomfort and only may exhibit symptoms of overall health decline. Overuse of Poorly Chosen Local Anesthetic: Ischemia Dr. Yuriy May is EXTREMELY selective about the anesthetic that he uses for all patients, and most notably, rarely uses local anesthetic with epinephrine. Most educated patients know that epinephrine, is a vasoconstrictor and therefore reduces blood supply to the anesthetized area during surgery. This is precisely the reason Dr. May prefers not to use vasoconstrictor, as for healing and tissue regeneration the biological system NEEDs blood flow. But stifling blood flow, some dentists are risking reducing the blood supply by such a degree that the result is “ischemia” which is “lack of blood flow.” Like the brain or any other part of the brain, without blood flow, there is no oxygen delivered to the cells, and without oxygen, our cells, like our brain, will being to die. At Natural Dentistry we specifically use shorter half life anesthetics like Carbocaine (Mepivicaine) and Prilocaine (Citanest). While cheaper local anesthetics like lidocaine can be purchased and used without epinephrine, the toxic byproducts formed by use of lidocaine are considered undesirable relative to other local anesthetics and thus avoided by the best biological dentists like Dr. May during surgical processes. By using shorter acting anesthetics with lower toxic byproduct creation and avoiding the use of vasocontrictors like epinephrine, Dr. May is able to not only avoid the formation of ischemia in patients but also reverse and regenerate ischemic disease processes such as cavitations in the jaw. Infection & Lowered Immune System: Bugs In addition to bacteria and infections arising from necrosis (a byproduct of several items on this list) other systemic secondary co-infections can thrive in the ischemic bacteria rich environment. 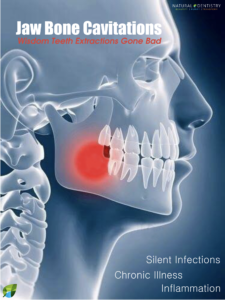 It has been documented in many surgeries that resolve cavitations, that upon surgically opening up the “festering hole in the jaw” oral physicians have observed other harmful elements including viruses, fungi and parasites which were also verified by biopsies. This complication can potentially be due to the lowered immune response, as the body is already embroiled in trying to fight against the chronic jaw bone infection. The immune system cannot keep up fighting the opportunistic pathogens and therefore an overgrowth of fungi, viruses and parasites can occur in addition to neurotoxic bacteria. During such complications, it has been documented that bacteria from within the cavitation site may produce very strong chemicals that are highly neurotoxic. Research has shown these toxins can then combine with chemicals or heavy metals, such as mercury, and form even more potent toxins. These neurotoxins can over time be released into the bloodstream where they destroy many otherwise critically important enzymes within the body. Low Vitamin Levels, Ineffective Immune Systems, Lyme Disease: With the inability to form healthy bone, strong angiogenesis (vascularization development) and overall low ability to heal and defend against inflammation, creates the perfect opportunitistic environment for cavitations to form where the wisdom teeth once grew. After the wisdom tooth extractions, which are often complicated by use of strong ischemia causing drug like lidocaine with epinephrine and conducted at inappropriate ages, a low vitamin D3 combined with the inability if the body to heal is the potential to help establish the very problem we aim to treat, ischemic bone disease which becomes a chronic source of infections, disease and malaise for patients. In addition, with such high diagnosis rates of Lyme Disease and various other Borrellia infections, it has been observed that the Borrellia virus tends to live and proliferate locally in the in the areas of cavitations, which have no ability to fight the Lyme infections as the immune system is not able to reach the areas of ischemia due to limited blood flow. Cavitations & NICO Diagnosis – Why don’t traditional dentists diagnose dental cavitations? Are cavitations real? Where is the research? Like osteoporosis, Ischemic Bone Disease is frequently not diagnosed and even less frequently treated. In many instances it is the symptoms of IBD that are treated rather the disease process itself and its causes. 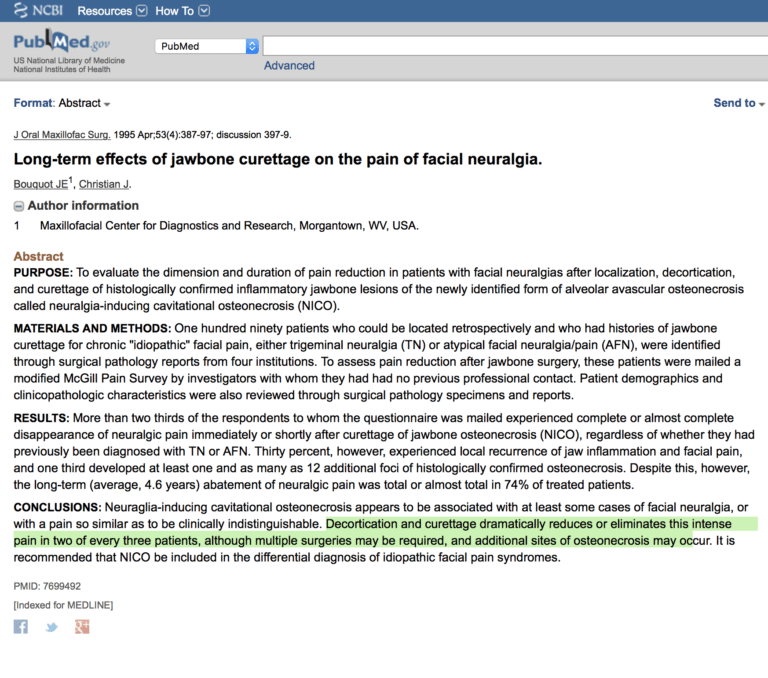 For example a patient with cavitations in the lower jaw may experience atypical facial pain (pain of an unknown origin) and will be prescribed medication for the pain. Another patient with a tooth located in bone tissue with cavitations may experience pain in that tooth because of pulpal ischaemia (ischemic pulpitis) and endodontic therapy (root canal treatments) will be performed to removed the inflammed pulp. In other cases antibiotics may be prescribed with temporary relief, as this does not treat the underlying issue of dead tissue and anaerobic bacteria present and festering in the jaw bone. 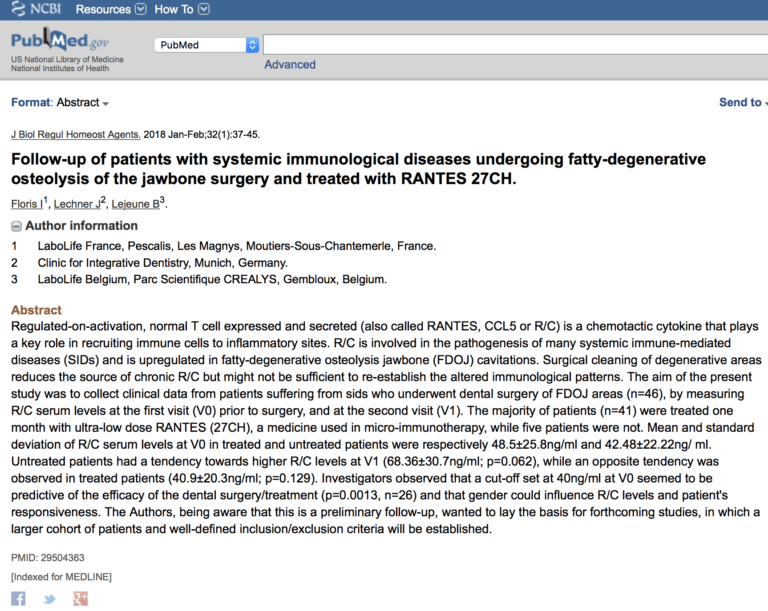 In order for you to understand that dental cavitations are real (published on PUB MED) in numerous articles and actually affect the body seriously and in many unpredictable and debilitating ways, here is a snap shot of a few articles by doctors and scientists exploring the detrimental effects of dental cavitations if left untreated, including the 30 fold increases in RANTES, a regulated-on-activation normal T-cell expressed and secreted is a chemotactic cytokyne (read: inflammation!) that plays a key role in recruiting immune cells to inflammatory sites. Ischemic Bone Disease Diagnosis – Why is it so difficult to diagnose cavitations? Mainly because it is difficult to see on x-rays and because there is a lack of awareness of the disease process itself. Of course there are cases where the disease process becomes so severe that it is difficult to miss. For example in the last 5 years there has been severe cases of osteonecrosis of the jaws associated with the use of bisphosphonates (Bisphosphonates are a class of potent pharmaceutical drugs used to inhibit bone resorption) Such cases not only involve the cancellous bone but also the cortical bone, leading to some of the cortical bone being exfoliated through the oral mucosa. This makes the disease process very obvious. Once properly diagnosed, treatment for a cavitation commonly starts by a series of ozone treatments, followed by surgically removing any dead bone, tissue and other debris. Additional treatment options include the use of lasers and ozone treatments as well as probiotics and other natural products/techniques. Once applied, these methods help to create a clean and sterile environment that promotes healing at the site, and ultimately throughout the body. As you read the section below, you will see immediately you aren’t just selecting a top dentist in Connecticut to perform your cavitation surgery, but you are selecting one of the most experienced and serious dental experts in the world (USA and Abroad) for your surgery along the likes of Dr. Volz in Switzerland, with whom Dr. May trained directly and uses some of the exact protocols for jaw infection remediation surgery and therapy. At Dr. May’s office, we take ischemic bone disease seriously, and for the patients who travel to us from all over the globe, they don’t come to see the top dental cavitations expert in the world just for surgery, the patient seek Dr. May out due to his all-encompassing and life altering protocols. Sad to say, Natural Dentistry has even experienced patients traveling for their 3rd or 4th ischemic bone disease surgery as the prior surgeries they had were unsuccessful. Luckily, the patients who select Dr. May for their first procedure win the jackpot, in a lucky way. The cavitation protocols do not get any more serious, robust or proven than that of Natural Dentistry Center’s Dr. Yuriy May. At least 2 weeks before the surgery scheduled date, all patient are highly recommended to start an aggressive anti-inflammatory diet as outlined in Dr. May’s Cavitation Surgery Protocol at least 2 weeks before surgery. (Diet Protocol: gluten free, diary free, grain free, sugar free, meat free, organic, unprocessed, highly alkalizing diet) The patients must have vitamin D3 levels that are above the minimal healing threshold as determined by Dr. May’s ischemic bone disease remediation protocol, and have usually been supplementing with his regiment of vitamins and supplements for 2 weeks prior the surgery date. 1 week prior to surgery, every patient starts with a series of ozone injections in to every single affected cavitation site. In addition, the injections of ozone are followed with procain therapy injections. Why are we doing more at Natural Dentistry Center than any other biological dentist performing the “same” cavitation surgery procedure? Well simply put, for extraordinary results, Dr. May has put together an extraordinary protocol. After all that time and energy and investment, do you want to approach your cavitation surgery from an average protocol – or do you want to do it RIGHT? The day of surgery, the patient will again undergo a series of ozone injections into each of the NICO sites, followed by procaine injections that maybe also mixed with sterile homeopathic compounds from Europe. After the surgery is completed, the patient will undergo a 40 minute nose and ear ozone insufflation. This part of the protocol is designed to fill all sinus and ear canals with a mix of ozone and oxygen, to continually fight the bacteria/infection/viruses/fungi that have been displaced and removed by the surgery. Another words, all the pathways of the head and neck are infused with ozone to help heal and create blood flow. One Week after the surgery, the patient will come in post-surgery evaluation, and another series of ozone and procaine injections. After the injections, another 40 minutes of ozone insufflation for the ears and nose will follow. Three weeks after the surgery, the patient will come in for their next series of ozone and procaine injections. A discussion about transitioning from the anti-inflammatory to a less restrictive diet, but still maintaining gluten free, diary free and low sugar components. Patients will be asked to complete a health evaluation on any changes you’ve experienced since the surgery – either positive or negative, in your health. Five weeks after the surgery, the patient will come in for their next series of ozone and procaine injections. Patients will be asked to complete a health evaluation on any changes you’ve experienced since the surgery – either positive or negative, in your health. 6 Months post surgery, a CBCT will be taken to assess healthy bone formation in the healed surgical sites. Patients will be asked to complete a health evaluation on any changes you’ve experienced since the surgery – either positive or negative, in your health.